Pictured above: Close-up of the inner workings of the Coastal Profiling Float. The world ocean is undergoing profound changes, particularly in the face of a changing global climate brought on by human activity. Innovation in the way we access, sample, measure, visualize, and assess the changing ocean is needed for further discovery, management, and conservation of this vital resource. Technologies developed by MBARI engineers and scientists, including these three advancements from 2017, often prove invaluable to learning about what a changing ocean means for the life within it and for human society. The world ocean is undergoing profound changes in its chemistry and fish populations. We need new techniques and tools to understand what those changes are and what those changes might mean for ocean ecosystems, species, and ultimately for society. MBARI’s Coastal Profiling Float (CPF) project, led by Scientist Ken Johnson and Mechanical Engineer Gene Massion, was motivated by the need to develop an autonomous platform to improve observations of the coastal ocean. In fact, a recent Coastal Carbon Synthesis report highlighted the need to further develop new autonomous platforms specifically designed to work in the continental margins. The coastal ocean plays a disproportionate role in the global carbon cycle, accounting for approximately 50 percent of annual phytoplankton production despite covering only five to ten percent of total ocean area. These high levels of biological activity significantly influence local patterns of carbon dioxide exchange between air and sea. In addition, the associated biomass supports a majority of global fishery production. However, coastal carbon cycling remains poorly quantified due to the challenges associated with observing such dynamic regions. These regions undergo short-term events such as hurricanes, storm water discharge, upwelling, and phytoplankton blooms, all of which impact local carbon cycle processes. Traditional ship-based strategies are impractical for observing these random events. Profiling floats, on the other hand, are arguably the only platform that can be (and have been) scaled up to a fleet large enough to support global- and regional-scale observing projects. They can be deployed to observe at depths beyond the surface ocean on an economically sustainable basis. The international Argo project is aimed at quantifying the heat content of the world’s ocean and has maintained a global array of more than 3,000 profiling floats for more than a decade. The SOCCOM program—Ken Johnson serves as associate director of this project—is building on the Argo legacy by deploying 200 floats in the Southern Ocean to determine its influence on the global carbon cycle and climate. 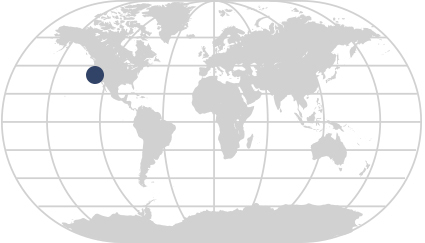 These technology and science projects are all based in Monterey Bay, California. Profiling floats move vertically through the water column by changing their buoyancy. The buoyancy “engine” in the CPF has roughly 10 times the capacity of the floats used on Argo and SOCCOM, allowing the CPF to profile through the strongest density gradients seen in the ocean, such as the Columbia River mouth and in the Arctic, and anchor on the seafloor to reduce horizontal drift outside the desired measurement area. In addition, the CPF supports a suite of biogeochemical instruments—to measure salinity, temperature, pH, oxygen, nitrate, fluorescence, backscatter, and solar irradiance—with the capability of supporting additional instruments. The CPF is proving to be a versatile platform. 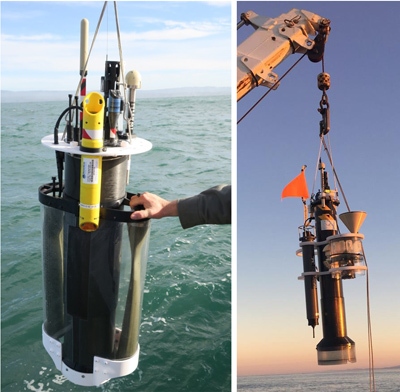 MBARI’s Biological Oceanography Group is using two of the floats with significantly larger payloads, including a sediment trap and acoustic telemetry, to study particle export dynamics in Monterey Bay. Combining particle and biogeochemical data will provide a more comprehensive understanding of coastal carbon cycle processes. Left, the Coastal Profiling Float, and right, the float configured for a science experiment by the Biological Oceanography Group. After several years of development and testing, the CPF is ready for regular science operations in 2018. The first science mission will involve three floats operated simultaneously in an array to investigate the source of nutrients supporting increased primary production in the northern portion of Monterey Bay. A key technical objective of the mission is to incorporate high-resolution models of regional ocean currents to autonomously control the position and location of the array throughout the experiment. An MBARI Wave Glider equipped with instrumentation for measuring surface, air, and, sea carbon dioxide will follow the floats during this field test. Comparisons between CPF and Wave Glider carbon data will inform future field studies. The experiment, to be run by MBARI Scientists Ken Johnson, Andrea Fassbender, and Yui Takeshita, represents the integration of early career scientists into MBARI research through strong mentorship from senior scientists and engineers. The CPF not only represents a potential foundation for a global in situ coastal ocean observing system, but it is playing a key role in forming strong institutional collaborations at MBARI to conduct multidisciplinary experiments to learn about random and short-lived ocean phenomena. Coastal upwelling is well-known for its role in stimulating primary productivity in the California Current Large Marine Ecosystem by drawing deep, nutrient-rich waters to the surface, to the benefit of life higher on the food chain. The lesser-known side of coastal upwelling is that upwelled waters can be a problem for some species. Improved measurements of coastal conditions (in part using new MBARI-developed sensors) have revealed wide fluctuations in temperature, oxygen, and acidity in nearshore habitats, in part due to coastal upwelling. Northwest winds along the coast drive upwelling that taps into deep waters from the top of the oxygen minimum zone; cold, oxygen-poor, and somewhat corrosive waters can be carried all the way into coastal habitats that were previously thought to be affected only mildly by upwelling. Recent research indicates that coastal species exposed to upwelling conditions can have lower growth rates, weaker calcification, and low rates of survival. Future upwelling is expected to be more stressful for coastal animals due to ocean acidification and declining oxygen levels. How nearshore marine life, including important fisheries, may respond to increased upwelling remains obscure, in part because complex experiments are required to disentangle the respective roles of changing temperature, acidity, and oxygen. 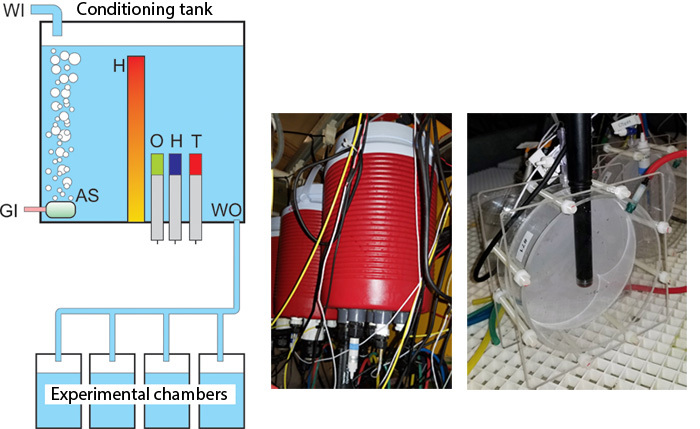 The design of the UpSys upwelling system (left): Oxygen, pH, and temperature are regulated in a conditioning tank (pictured in center) and water is delivered by gravity to experimental chambers (pictured at right) where animal larvae are placed. To gain a glimpse of the influence that present-day or future coastal upwelling may have for nearshore ecosystems, MBARI has developed an “Upwelling Simulator”, termed the “UpSys”. The simulator is a laboratory aquarium system capable of controlling upwelling-related water qualities—temperature, oxygen, and acidity (pH)—in experimental tanks. The UpSys can simultaneously control conditions in 15 conditioning tanks, each programmed with scheduled changes in conditions. Each of these tanks delivers water to several smaller experimental chambers where animals are exposed. Performance of the Upwelling System over four days, showing set points (gray lines), conditioning tank values (red lines) and experimental chamber values (light blue). The bottom graph shows gas flow values for nitrogen (red), oxygen (green), and carbon dioxide (blue). upwelling events are typified by a simultaneous reduction in temperature, oxygen, and pH; but for researchers, such changes in all three parameters makes it difficult to identify the real culprit among them that could be responsible for a change in the performance (such as growth and survival) of organisms. Because the UpSys can control temperature, oxygen, and pH independently, researchers can measure their individual and combined effects on marine organisms. For example, how do animals respond to a simulated upwelling event in which temperature remains constant? Independent control of each parameter provides a wide range of possible experimental scenarios. The simulator is currently being used to measure the sensitivities of different life stages of coastal abalone species to current and future upwelling stress. This new upwelling system can help researchers understand how natural and human-caused climate change is affecting coastal species and ecosystems. 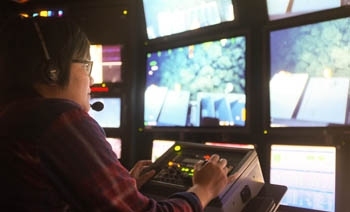 Postdoctoral Fellow Charmaine Yung at the camera controls during a cruise on the research vessel *Western Flyer*. Marine algae perform half of global photosynthesis. These photosynthetic microbes are important for uptake of carbon dioxide from the atmosphere and forming the base of marine food chains. Yet we know that these communities shift as ocean conditions change. These types of changes are not new; seasonal changes are part of the local ecosystem in Monterey Bay and also occur in the open ocean. But now layered on top of seasonal and interannual variations we have the additional perturbation of much higher atmospheric carbon dioxide levels and associated changes like ocean warming. How do these changes impact the individual algae that make up phytoplankton communities? Do we actually need to understand individual groups of algae or can we focus just on overall photosynthesis? Scientist Alexandra Worden with the photo-bioreactors she and her team use to culture marine microalgae in the laboratory. Currently our ability to assess change in these communities is hampered by not having the baseline information to resolve different algae in the field at a sufficient level to connect to their ecological roles and growth requirements. This is something MBARI Scientist Alexandra Worden and her team are working to change, by developing more sensitive methods for gathering this kind of data. So their first step is to generate a baseline knowledge of natural phytoplankton communities, their composition, and temporal changes within the seasonal framework. 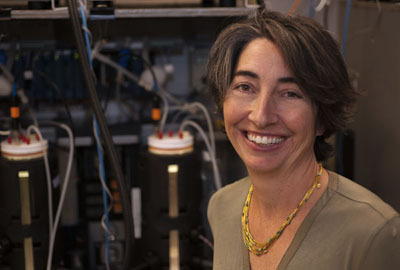 Worden and her team have learned that algae are so different from each other that to understand the ocean, they will have to broaden their scope beyond photosynthesis or primary production. Just think about trying to understand crop production if we were to average data from all terrestrial plants—including trees. The same goes for ocean communities—they are too different in terms of resource needs, food chain roles, and interactions with other microbes. Barry, J.P., D. Graves, C. Kecy, C. Lovera, C. Okuda, C.A. Boch, and J.P. Lord (2017). Chasing the future: How will ocean change affect marine life? Oceanography, 30: 60-71. Lord, J.P. and J.P. Barry (2017). Juvenile mussel and abalone predation by the lined shore crab Pachygrapsus crassipes. Journal of Shellfish Research, 36: 209-213. Lord, J.P., J.P. Barry, and D. Graves (2017). Impact of climate change on direct and indirect species interactions. Marine Ecology Progress Series, 571: 1-11. Hamilton, S.L., C.A. Logan, H.W. Fennie, S.M. Sogard, J.P. Barry, A.D. Makukhov, L.R. Tobosa, K. Boyer, C.F. Lovera, and G. Bernardi (2017). Species-specific responses of juvenile rockfish to elevated pCO2: From behavior to genomics. PLoS ONE, 12: e0169670. Choi, C.J., C. Bachy, G.S. Jaeger, C. Poirier, L. Sudek, V.V.S.S. Sarma, A. Mahadevan, S.J. Giovannoni, and A.Z. Worden (2017). Newly discovered deep-branching marine plastid lineages are numerically rare but globally distributed. Current Biology, 27: R15-R16. Clayton, S., Y.-C. Lin, M.J. Follows, and A.Z. Worden (2017). Co-existence of distinct Ostreococcus ecotypes at an oceanic front. Limnology and Oceanography, 62: 75-88. Cuvelier, M.L., J. Guo, A.C. Ortiz, M.J. van Baren, M.A. Tariq, F. Partensky, and A.Z. Worden (2017). Responses of the picoprasinophyte Micromonas commoda to light and ultraviolet stress. PLoS ONE, 12: e0172135. After developing baseline information of marine algae, the next step then is to understand how different algae will respond to increased carbon dioxide, and its partner ocean acidification, and other predicted impacts associated with warming (e.g., further nutrient depletion in some regions). This is nearly impossible to test in the field in a controlled way. So MBARI Scientist Alexandra Worden and her team have worked to develop instruments that allow them to grow and experiment with algae under predicted future conditions. These instruments are called photo-bioreactors. The team has gleaned new information from the photo-bioreactors that is dramatically different from all prior experiments. The instruments allow the scientists to impose conditions limiting specific nutrients (rather than starvation) whereas in traditional closed-system algal culturing experiments this can’t be achieved. The team has also developed ways to monitor how the photosynthetic apparatus changes on a per-minute basis. Combining this with growing environmentally relevant algae species in the lab, and honing molecular approaches to how cells acclimate to changing carbon dioxide and nutrient conditions, the team has found that prior studies don’t reflect the predicted future scenarios. Totally new aspects of the basic biology of algae have also been discovered and can now be used to interpret field data. 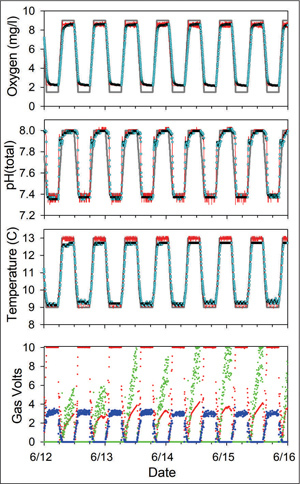 These new findings can also be used to develop more sensitive in situ sensors for when algae are experiencing various perturbations and the consequences for their photosynthetic rates and primary production. The bio-reactor studies are being combined with deep-sea activity incubators developed by Worden’s team to see how microbial communities degrade sinking algae—and the long-term fate of algal carbon. Collectively these pieces will provide better parameterization for global models of the carbon cycle and ecosystem change, as well as fundamental insights into key algae and bacteria in the ocean and how other species may become more prevalent in future oceans. 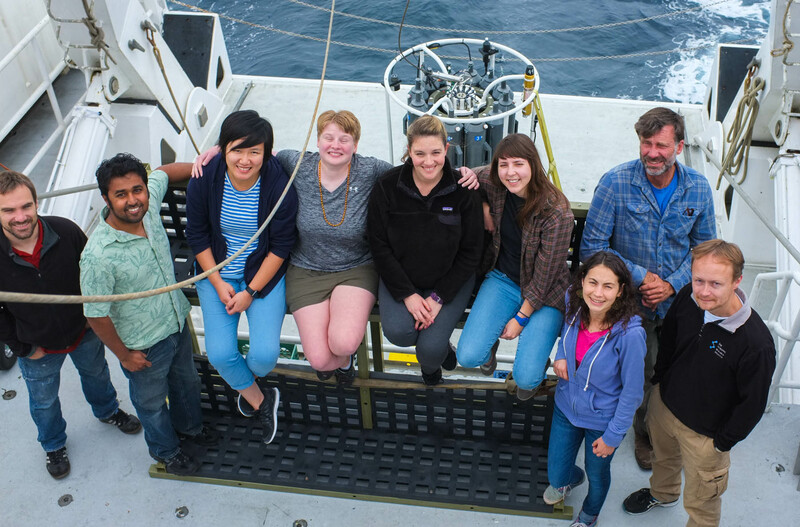 Participants in a Marine Microbial Ecology Group 2017 cruise aboard the R/V Western Flyer, from left: David Needham, Mohammad Moniruzzaman, Charmaine Yung, Charlotte Eckmann, Marguerite Blum, Maria Hamilton, Rachel Harbeitner Clark, Erich Rienecker, and Sebastian Sudek. New seafloor observatory system will enhance efforts to visually and accurately assess the rockfish fishery.